Janet Poole House student accommodation is often described as one of the most prestigious and desirable locations in London, with good reason. Located in one of the capital’s most elegant streets, this leafy idyll is the perfect residence for university students who require fashionable accommodation and living right in the heart of the city. The area houses several universities, including University College London, Imperial College London, University of Westminster, University of London, SOAS (School of African and Oriental Studies), among many others! 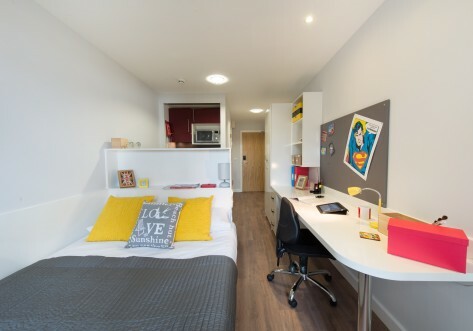 Janet Poole House features contemporary student accommodation to meet all tastes, ranging from triple/twin rooms to deluxe single studios. Each room has a television, and all kitchens are extensively equipped with a fridge/freezer, sink, microwave, cooker/extractor fan, dining table and chairs. Every room in the elegant Georgian townhouse features air conditioning and offers a tastefully decorated, comfortable place to relax after a hard day of lectures. There is also up to 100Mbps WiFi available throughout the building, allowing you to shop online or research your latest essay. You can relax with friends in the comfy and cosy Bloomsbury Snug room, where you can catch a classic movie while nestling on one of the sumptuous bean bags. On fine days take in the atmosphere and socialise in the courtyard with a barbecue. 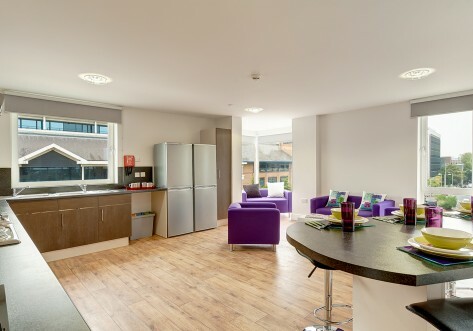 To ensure you’re comfortable and enjoy the facilities and the huge variety of activities the area has to offer, Janet Poole House student accommodation has its own helpful on-site hospitality team and a 24-hour helpline available, so you can always report any issues at any time. Janet Poole House boasts superb transport links. You can catch the tube from the nearby Euston Square, Warren Street, Goodge Street and Russell Square stations, or jump on the number 24 or 29 bus right outside the property on Gower Street. You’ll be based in a great location close to some of London’s major hot spots such as Soho, Mayfair and Piccadilly. Soho offers fantastic night life for students, who can often benefit from a variety of promotional offers. However, you don’t have to travel far to socialise. Bloomsbury is home to a wide range of bars and restaurants for when you’re in the mood to treat yourself, or you can take in a film at the Odeon or Curzon cinemas, a mere five-minute walk away. If you want to explore London, some of the city’s most iconic destinations are within easy reach of Janet Poole House. The world-famous Oxford Street and Regent Street shopping centres are a 15-minute walk away, while the bright lights of Leicester Square are a similar distance. Why not visit The British Museum around the corner, or take a short bus ride to the view the world-renowned architecture of Trafalgar Square? You can enjoy the sports facilities in Regents Park, a 10-minute walk away, or relax in Hyde Park, a mere 15-minute bus ride from Gower Street. The city centre is also easily accessible, where you can find hundreds of museums, the London Eye and Buckingham Palace. 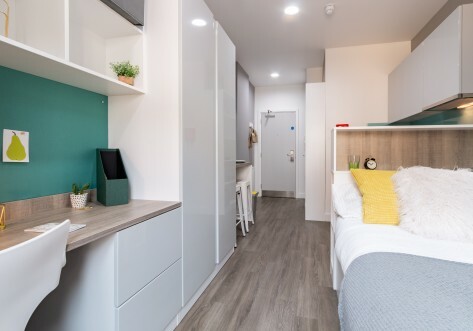 The Twin Ensuite Room is a compact shared room approx 20m2 with two 3/4 beds and an ensuite bathroom as well as study desks and plenty of storage. The kitchen is shared with another Twin Ensuite Room. A spacious self-contained shared studio measuring approx 23m² with two single beds. All of our Classic Twin Studios have a private kitchenette and a modern en-suite bathroom as well as study desks and plenty of storage. A spacious self-contained shared studio measuring approx 25-27m² with two 3/4 beds. All of our Bloomsbury Twin Studios have a private kitchenette and a modern en-suite bathroom as well as study desks and plenty of storage. The Gower Room measures around 9-12m² and offers a comfortable private bedroom with a 3/4 size bed and all our usual bedroom furniture. Your separate bathroom is shared with a couple of your current or future friends, and your shared kitchen is also perfect to hang out and enjoy a tasty meal. Your Premium Twin Studio is a shared studio with two 3/4 sized beds or two double beds in a large, comfortable bedroom. 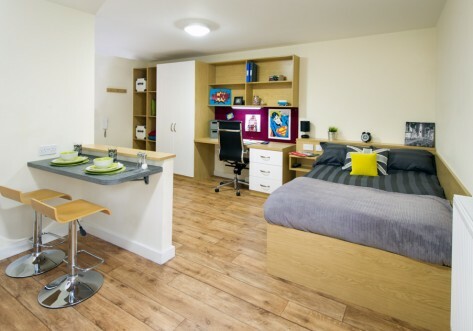 The studio has an ensuite bathroom and kitchenette within the room with study desks and plenty of storage. Your Deluxe Twin Studio is our largest double room! Perfect for sharing with a friend! Two 3/4 size beds in a spacious, open-plan bedroom. Our Deluxe Twin Studio includes a separate kitchen and a modern en-suite bathroom. The Premium Twin Apartment is a huge 45m² apartment, with 2 double beds within a shared bedroom. You'll have a private kitchen with integrated appliances and a modern ensuite bathroom. With unlimited 100Mbps wifi and newly refurbished common areas, outdoor courtyard, comfortable snug and on-site laundry. Available for single occupancy. The Deluxe Twin Apartment is the largest room in the building measuring 52m², with two double beds in the large, shared room. The apartment is fitted out with contemporary furniture and with a large private kitchen with integrated appliances and a modern ensuite bathroom, the apartment is the height of luxurious student living. With unlimited 100Mbps wifi and newly refurbished common areas, outdoor courtyard, comfortable snug and on site laundry. Available for single occupancy. Bloomsbury Janet Poole House is undergoing extensive refurbishment and improvement works during summer 2018, so all images are indicative. The Gower Ensuite Room measures around 11-12m² and is an intimate and private space to relax or study. Each room comes with a ¾ size bed and our usual bedroom furniture and its own modern en-suite bathroom. Your kitchen will be shared with 1 or 2 other residents, depending on which room you choose. Perfect for those who want their own private space, but still enjoy a comfortable social environment. The Gower Ensuite Room measures around 11-12m² and is an intimate and private space to relax or study. Each room comes with a ¾ size bed and our usual bedroom furniture and its own modern en-suite bathroom. Your kitchen will be shared with 1 or 2 other residents, depending on which room you choose. Perfect for those who want their own private space, but still enjoy a comfortable social environment. The Bloomsbury Ensuite Room offers a comfortable bedroom with a 3/4 double bed and our usual bedroom furniture. You room comes with a modern ensuite bathroom and a shared kitchen. The ever popular Classic Studio measures around ² and comes with everything you need for a comfortable place to call home. This studio comes complete with a modern kitchenette and en-suite bathroom. The Gower Studio is a an open plan bedroom measuring around 17-18m² with either a double or 3/4 size bed, study desk and plenty of storage. The studio has a modern en-suite bathroom and your own kitchenette within the room. The popular Bloomsbury Studio is a really spacious self-contained studio measuring 18-20m², that comes with everything you need for a comfortable place to call home. This studio comes complete with a modern kitchenette and en-suite bathroom. The Deluxe Apartment is the largest accommodation in the building measuring 52m², with a double bed, contemporary furniture, a large personal kitchen with integrated appliances and a modern ensuite bathroom, the apartment is the height of luxurious student living. With unlimited 100Mbps wifi and newly refurbished common areas, outdoor courtyard, comfortable snug and on site laundry. Ideal for a couple. The Bloomsbury Suite is a comfortable and spacious self-contained apartment with a comfy ¾ sized bed and all of our usual bedroom furniture. The Bloomsbury Suite offers a modern en-suite bathroom and its own self contained kitchen. There are no special offers available at the moment. Please check back soon.